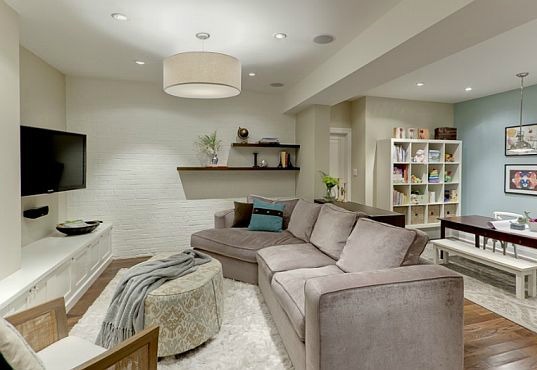 Declutter your basement and stage it to add buyer appeal before you put your home on the real estate market! Is your basement dark and dreary? Is it a repository for everything that doesn't fit in the rest of your home? Do you dread having to go down there to do your laundry? Well, home buyers will most likely feel the same way. Home buyers are more concerned with actual living space. If your basement doesn’t fit in this category, don’t worry. You don’t need to do a basement renovation to get a buyer, just make sure it’s clean and freshly painted. A basement that is free of clutter will add square footage to your house and help home buyers to envision it’s potential use. Not all home owners are fortunate enough to have a lovely finished basement. If your basement falls in the "creepy dungeon" category, don't despair! There are some interior decorating home remedies you can do to lighten up this space and turn it into extra square footage without having to do a complete basement renovation. Decluttering your basement can seem like a daunting task, especially if you have been stockpiling stuff for years. The great thing about decluttering is that you get a head start on your packing. You'll need to assemble boxes, totes, garbage bags, tape and a permanent marker. Move those items you plan to keep to a temporary storage unit. Declutter your basement by packing up everything else you plan to keep for your new home by moving it to a temporary storage unit. Simply cleaning, painting and getting rid of bad smells and mold (and fixing problems) will greatly enhance your basement. Removing accumulated stuff and creating empty space will give the impression of spaciousness to home buyers. See removing bad odors. Remove all cobwebs and insects. Use a broom to reach high areas. Wash windows inside and out until they sparkle. If windows are small, take down window treatments to let as much natural light in as possible. Take down lighting fixtures and wash them; insert the highest allowable wattage bulbs. If switch plates are grimy, unscrew from the wall and spray with Johnson Scrubbing Bubble Bathroom Cleaner. Wipe clean. Replace broken outlet covers-- make sure they are all the same color. If you have appliances in the basement, give them new life by wiping them down, inside and out. This includes; washer and dryer, furnace, air conditioners, water heater, etc. Dusty dingy appliances will give home buyers the impression that they are old and need to be replaced. Fix anything that needs repairing; windows, holes in the walls, leaks and squeaky doors. If your basement is moldy and smells of mildew, go to getting rid of mold for help on dealing with this problem. A great way to improve the appearance of concrete basement floors is to paint them. See the instructive video below by ppgprofessional for directions on how to clean, prep and paint concrete floors. When your basement is fresh and clean, move on to the next task of staging it for your home sale.